First Great Western (FGW) has said demand has been very strong for its new summertime direct service from London Paddington to Newquay. The daily service started on Monday, with the eight-carriage train completely full by the end of the week. For many years the only direct trains to Newquay ran during summer weekends, but the new morning service will run throughout July and August. FGW said it was delighted with the success of its groundbreaking service. A spokesman said the unsettled weather had not put people off because many passengers were apparently looking to surf rather than sunbathe. 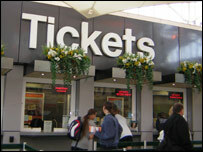 FGW said the peak summer service would remain a feature of its timetable for the rest of its franchise.